Tammy Joy Kennedy is the Red Rider in Oklahoma. A health freedom fighter and second generation Nerve Signal Interference (NSI) Specialist, she has done homage to the Son as the First Disclipe of Craton, her grandfather. Dr. Earl Franklin Craton has been published numerous times in the chiropractic journals and even won the Texas Chiropractic College’s (TCC’s) Centennial Award in 1995. Craton, which means land, denounced his profession in 1996 and Tammy has since found extremely strong parallels to Hopi prophecy in the ensuing battle for the public health, safety, and welfare of the people. Tammy wishes to share/train Health Professionals with the life saving, and body healing techniques, pioneered by her Grandfather, but are shunned by most MDs and Chiropractics alike. I come on about 43 minutes into the program. On the Red Rider: In 2004 I attended my first health freedom conference in Minnesota. I rode into the conference with three other women, all from Oklahoma. The pressing matter at hand was CODEX. As arrangements were being made to attend the conference I had spoken to the older woman of the group. 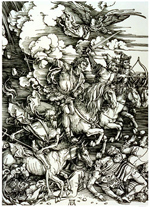 She told me then that the four of us were going to ride in like the Four Horsemen of The Apocalypse; the other women were also excited about my late addition to their group as well. When I finally met the ladies I noticed that each of the four colors (White, Red, Black, and Pale) were all represented in our hair colors and told them so. They were excited, and we all joined hands in a circle and prayed for our hopes of health freedom in the world. Tammy was first on F2F in April of 2005. A health freedom fighter and second generation Nerve Signal Interference (NSI) Specialist, she has done homage to the Son as the First Disciple of Craton, her grandfather. Dr. Earl Franklin Craton has been published numerous times in the chiropractic journals and even won the Texas Chiropractic College’s (TCC’s) Centennial Award in 1995. Craton, which means land, denounced his profession in 1996 and Tammy has since found extremely strong parallels to Hopi prophecy in the ensuing battle for the public health, safety, and welfare of the people. Most of the population has a neck/head miss-alignment, which, Tammy says not only is responsible for poor health, but, when properly adjusted, has shown an opening, or clearing of spiritual connections and enlightenment. She has also had GREAT opposition to this technique, both within and without the medical community; being ordered by a judge NOT to do it. 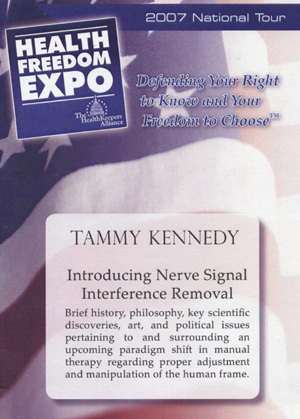 Tammy will be in Chicago this coming weekend at the Health Freedom Expo, where James hopes to meet her and have this controversial adjustment. These streams are encoded with the mp3PRO codec at 24Kb mono for excellent quality in a relatively small file size. ANY player can play them, but certain players can "recognize" the PRO coding and release the extra sound fidelity. Tammy returns again this week. A health freedom fighter and second generation Nerve Signal Interference (NSI) Specialist, she has done homage to the Son as the First Disciple of Craton, her grandfather. Dr. Earl Franklin Craton has been published numerous times in the chiropractic journals and even won the Texas Chiropractic College’s (TCC’s) Centennial Award in 1995. Craton, which means land, denounced his profession in 1996 and Tammy has since found extremely strong parallels to Hopi prophecy in the ensuing battle for the public health, safety, and welfare of the people. Tammy was at the Health Freedom Expo this weekend, where many were helped after years of "conventional" treatment. She encountered very visible and vocal objections and professional threats from Chiropractors, while receiving open arms support from Naturopaths and Massage Therapists. A health freedom fighter and second generation Nerve Signal Interference (NSI) Specialist, she has done homage to the Son as the First Disciple of Craton, her grandfather. Dr. Earl Franklin Craton has been published numerous times in the chiropractic journals and even won the Texas Chiropractic College's (TCC's) Centennial Award in 1995. Craton, which means land, denounced his profession in 1996 and Tammy has since found extremely strong parallels to Hopi prophecy in the ensuing battle for the public health, safety, and welfare of the people. Note: Some Browsers will automaticall play the download. If so, and you wish to SAVE the mp3 to disc, RIGHT-CLICK on the PART Button and choose "Save Link As" (Firefox) or "Save Target As" (I.E.) or for MAC OS X (Safari), CTRL-Click on the PART Button and choose "Download Linked File"
Thanks goes to James Arthur Jancik, the "Black Knight" of Talk Radio for helping me to get my message out. Visit James' Feet to the Fire Radio Show. This page was first posted on January 25, 2007 and last revised on September 1, 2010. Copyright © 2000 - 2010 for the home link graphic by Tammy Joy Kennedy. All rights reserved.